Jane Austen was seen in a horseless carriage attending Mercedes-Benz Fashion Week, and wrote a review of the current fashions. Oh, my. Not to be outdone, Mrs. Elton reviewed Emma on Austenprose. She's as catilly chatty as ever, and a flippertygibbet, if you ask me, but according to author Diana Birchall there's more to her than first meets the eye. 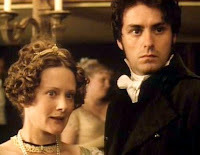 And Ellen Moody thinks Something Odd is Going On With Mr. Knightley ... please click here to find out what it is. Ms. Moody also created the Jane Austen calendars. If you haven't discovered these timelines of the plots in Jane's novels, click here for a wonderful surprise. Don't forget to keep sending in your ideal Pride and Prejudice Musical cast. The contest remains open until midnight on the 29th. For contest rules, click on the link in the sidebar.